Managing arduino projects can be a nightmare because you only see the software side in your code documentation, the hardware is hard to keep track off. 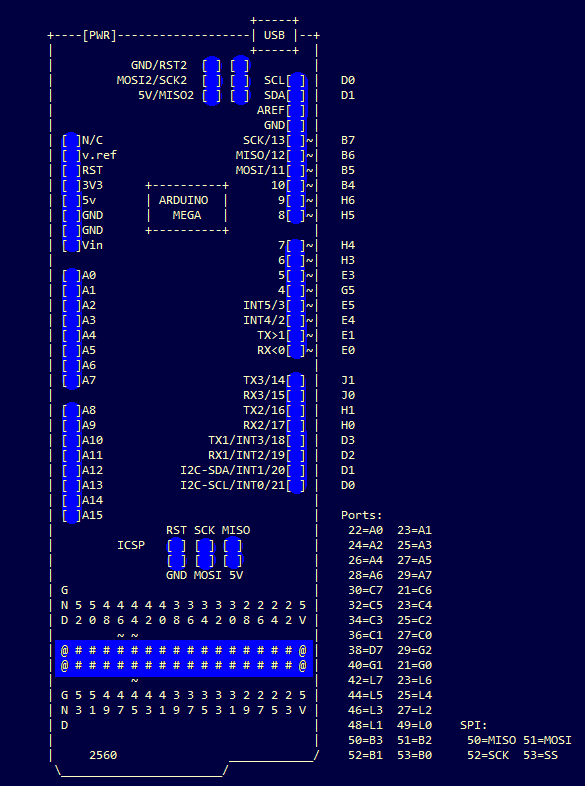 To enable easy documentation of pin assignments, I created a couple of ASCII art arduinos; complete with ports, PWM and coms all marked. Simply paste as a comment into your code and marvel at your new found organisation. I suggest altering the image (eg. a letter or X in the [ ]) to keep track of the pins you ended up using. 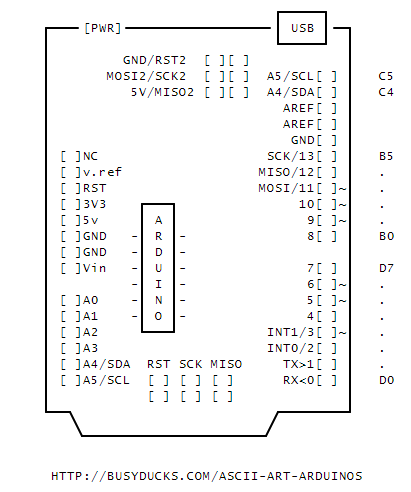 Here is copy/paste-able Arduino Pinout ASCII art ready to go (tip: you can use the copy button, at the top of each ASCII art piece, to make the process easy). | [ ]IOREF MISO/12[ ] | . | [ ]RST MOSI/11[ ]~| . | [ ]3V3 +---+ 10[ ]~| . | [ ]5v -| A |- 9[ ]~| . | -| I |- 6[ ]~| . | [ ]A0 -| N |- 5[ ]~| . | [ ]A1 -| O |- 4[ ] | . | [ ]A2 +---+ INT1/3[ ]~| . | [ ]A3 INT0/2[ ] | . | [ ]A4/SDA RST SCK MISO TX>1[ ] | . You may notice that the clean layout of these diagrams makes them very readable, personally I feel many graphical versions present too much information at once. This idea seems to have caught on quickly, so I will keep the art coming. Redit user plasticluthier adapted a nano version here, I thought that was spiffy, so I fixed an error tweaked it a bit and added chips and ports. I have a Pro Mini project coming up, so knocked one of these out as well. Just fill in the spaces, either with an X, or with a reference letter which you document below the ASCII art. They can be pasted into code comments, (use /* and */ in the arduino IDE to create a block comment). They can also be useful in forums, when you need a quick arduino diagram, but don’t want to fire up an image editor. This is a snippet from a recent project. The sketch starts out with comments that set-out how the hardware is setup, this helps me a lot when I have to look at it again in a years time. Its also great if I want to share the code, as people don’t need to dig-around in the code to see how to connect the arduino to other devices. | [ ]v.ref MISO/12[A] | . | [ ]RST MOSI/11[A]~| . | [ ]5v | A | 9[ ]~| . | -| I |- 6[A]~| . | [ ]A0 -| N |- 5[C]~| . | [ ]A1 -| O |- 4[A] | . | [ ]A2 +---+ INT1/3[A]~| . | [ ]A4 RST SCK MISO TX>1[ ] | . 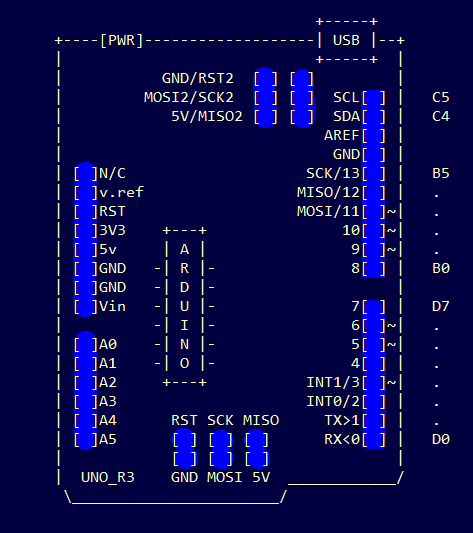 // Connect CLK, MISO and MOSI to hardware SPI pins. I modified a version of this for markdeep and made it available for download here. A console version, by paulfantom, for terminal users is available here. I will check back on the facebook page for any comments, like the page to stay up to date. I set up a redirected URL http://busyducks.com/ascii-art-arduinos that is both the CC-BY attribution line, and will always redirect to the latest version of these ascii art arduinos. 1-12-2015 Fixed typo’s spotted by Basile Laderchi. Also minor visual tweak to the arduino CPU.